After all this time yeast breads scare me. All of the varieties that I have tried have failed miserably. I think it’s the rising stage that I screw up. I don’t let it rise enough, or the temperature isn’t warm enough in my apartment, or my yeast isn’t activated. I don’t know. I’m not ready to give up on yeast breads yet but I’m really not dying to make one anytime soon. Quick breads though? I like those. No yeast, no rising time, just easy and quick. 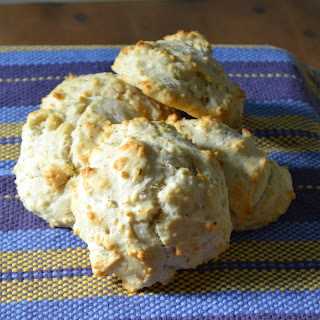 Drop biscuits are probably one of my favorite kinds of quick bread because there’s no rolling or cutting out circles, just spoon it on the baking pan and bake it as it is. I think they look so rustic and yummy this way. I really like the spices in this recipe. The pepper and rosemary give the biscuits a little kick. I served them with a steak and bleu cheese salad and sweet baked potatoes with goat cheese and roasted grapes and it really finished off the meal nicely. I can’t wait to play around with the spices in this recipe based on what I’m serving it with! Preheat the oven to 400F. In a large bowl, combine flour, baking powder, salt, rosemary, cracked pepper and sugar. Stir until well combined. Add the cubes of cold butter to the flour mixture and work with your hands or a pastry cutter until the butter is worked in to the flour. The texture should resemble dry sand when it is done. Starting with 3/4 cup, add in the milk until the mixture just reaches a paste-like consistency. I used a little less than 1 cup of milk to reach this point. Line a baking sheet with parchment paper and spoon 2/3 cup of dough (there should be 8 dollops of dough). Bake the biscuits at 400F for 18 to 22 minutes, until the biscuits are a light golden brown. Serve warm.